President al-Assad9President Assad: No, because the problem with the American officials is that they say something and they mask their intentions, they go in a different way. They say something, they say the opposite. They say something, they do something different. So, you cannot tell what are their real intentions. What I’m sure about is that they don’t have good intentions towards Syria. Maybe they are making tactics, maneuvers, but they haven’t changed their intentions, as I believe. 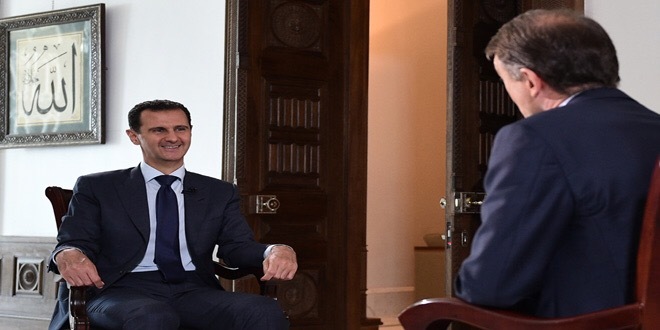 President al-Assad8Question 48: Well, one difference between them clearly is that Mrs. Clinton is determined, it seems still, to get rid of you. At least that’s her stated position. Mr. Trump says he’s focusing on ISIS, leave you alone. That’s a clear difference between the two. Hillary Clinton, well, I’ll ask you the question: does Hillary Clinton represent more of a threat to you than Donald Trump?